Over the last few weeks we’ve been trying out some basic electronics on our girls programming group. It seems to be going well; they like sitting around a table and creating things and are still at the stage when getting a switch to control a light feels like an amazing achievement. But there’s only so much you can do with sticky tape to hold wires in place and we can see that, if we progress, we’re going to have to face a future with soldering. I’ve spent a long time avoiding soldering, which has led to some creative, but very bodgy, workarounds. Ian D in contrast has been soldering for decades, from the days of hand-built computers that involved actual wires, and is a dab hand with a soldering iron. There really isn’t an alternative to soldering once you start to really potter with electronics: duct tape, blu-tac, and the like are fine for really basic learning but not beyond that. Even my new favourite thing, copper tape, which is a fantastic workaround for many applications, doesn’t help with attachment to switches and the like. So soldering it is. The tricky part is knowing how to introduce it to a group of kids. There’s the required manual dexterity for it to work; and then there’s an obvious issue around doing anything with a very hot implement and lead fumes. We ran a test during the week on a small group (aged 11-13) and had the kids create a simple circuit that matched a switch to a LED. They immediately got what it was all about and the advantage soldering gave them. There was no sign that they had any more problems with the dexterity end of it than a newbie adult would have. As Ian pointed out – ideally you need three hands for soldering. Really the biggest challenges were to do with the lead and the hot soldering iron; but with a small group it’s easy enough to both watch them and to emphasise the safety issues. The part of the project the kids seemed to have most actual difficulty with was stripping the wires which, surprisingly, they all struggled with. But introducing soldering to three geeky kids is not quite the same as pushing it to a larger group. 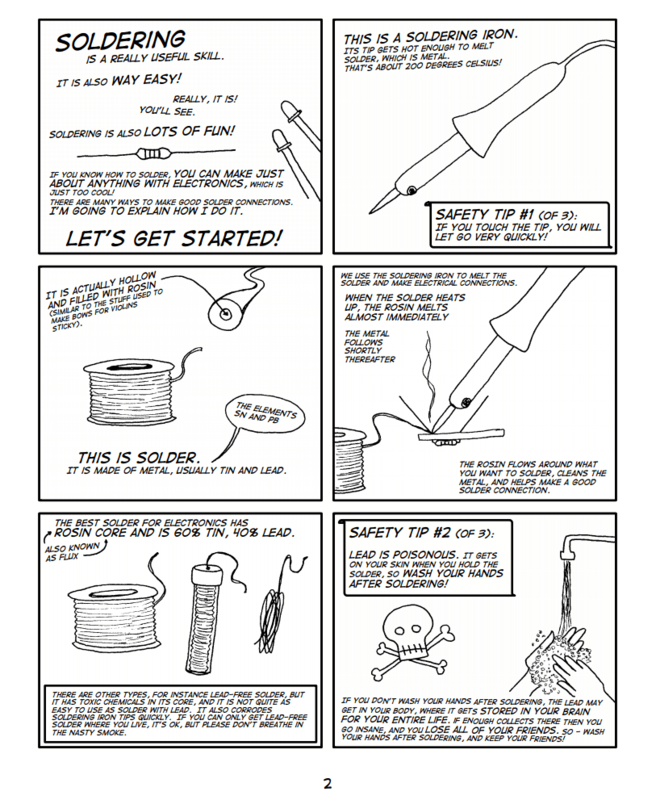 So, thinking about how to do this with a larger group, I started looking about for helpful resources and found this excellent cartoon guide: Soldering is Easy – Here’s how to do it. There’s still more planning required before we try this on our girls group, but it seems to me that giving the kids the guide and backing it up with personal guidance would be a viable way forward. And if we can get it to work it opens up some really exciting possibilities for more complex projects.